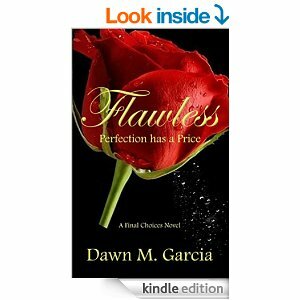 A couple of days ago I started a new book, FLAWLESS – by Dawn M. Garcia the links for which I’ll provide shortly. At this point, I’ll state that I’m giving this genre a try with an open mind and have never read a novel by this author before. I tend to read while I’m at work waiting to unload my truck, or indeed the reverse, waiting to load. Sometimes it can be a good hour or two which gives me time to either read or continue with my own novel, Salby Evolution – the sequel to the already published Salby Damned. However, I digress…………..I fired up my kindle and settled in to begin this book with gusto. First impressions a mere 12% in are very good, the storyline takes you straight into the action and has you keen to find out what happens next. Given that I’m not that far in, I’m not going to give it any form of review just yet but did feel the need to get it out there so that anyone interested might also like to give it a read. The author, Dawn M.Garcia can be found on twitter and is one of the growing number of IA writers to be found, producing some high quality novels and tales. This story has me pretty engrossed at the present time but please, pop back in a week or so and I’ll likely have finished it and placed an honest review of it. In the meantime, happy reading everyone!